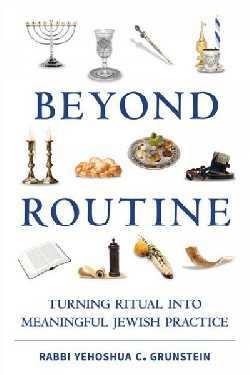 Beyond Routine cleverly addresses the routine commandments and rituals in Judaism and explain show they can become more meaningful. Judaism is filled with many customs, such as shaking the four species on Sukkot or lighting candles to welcome the Sabbath. Rabbi Grunstein noticed that while many Jews know the “how” of performing these mitzvot, they do not understand how these mitzvot can elevate their own level of holiness. Looking at these rituals in this light, Beyond Routine: Turning Ritual into Meaningful Jewish Practice addresses questions such as: How is each custom significant? What emotions should one have while and after performing the commandment? How can a technical observance actually influence a person? It is the goal and hope that the reader will gain an understanding of the mitzvot themselves, and perform them with greater appreciation and personal meaning.